Cradled by the bold red cliffs of the Grand Canyon is the isolated village of Supai, where thousands of eager travelers pass by every year to reach the world-famous blue-green water of Havasu Falls. However, what they often overlook is the village’s lifeline — its mules. Supai is one of the last indigenous villages in the United States without access to paved roads, and although a helicopter is available to deliver supplies to the village, it’s almost completely sustained by the sweat and vigor of its hardworking animals. The village can be reached by traveling along an 8-mile trail interlaced with boulders, pools and the breathtaking cliffside views that only the Canyon can offer. The trail is rigorous, and everything that is carried in — food, mail, garbage and the luggage of travelers — must also be carried out. Carletta Tilousi, a member of the Havasupai Tribal Council, grew up in the village and spoke with Arizona Highways about her tribe’s relationship with its pack animals and how village life has changed due to the area’s rising popularity. How have things changed in recent years? Life was really simple when I was growing up, but in the last 30 years, it has completely changed. The tourists are coming in more than ever before. There weren’t nearly as many tourists coming in; now we have about 500 a day. The tribe will need to decide what we can sustain and what we can’t. Is there a veterinarian in the village, or is there any medical aid available for animals if they get sick or injured on the trails? We have an animal control officer to respond to any incidents, and they do the evaluation. If we need a veterinarian to come down, we would have them do so. They usually visit the village every three months, and we’re currently scheduled for a spay and neuter for our dogs and cats. Those are usually scheduled ahead of time, and they are all volunteers. If an animal falls and injures itself in the Canyon, how is that incident usually managed? From my horse-riding experience, they don’t get injured unless they’re startled, and if they’re not tame, hikers can startle them. The horse has to be really tame to run those trails. If they do get injured, they are assessed, and if they can’t walk, then I believe they are euthanized. I don’t remember any recent cases where we had to do that. Are there any alternative methods of transportation for visitors? We have ATV vehicles that are used for emergencies, and they are used to transport elders to and from their houses. If there’s any sign of distress among the tourists, the packers will go out of their way to help them. Usually the horses are used for travelers, for the tourism industry. There are only a few families that own horses in the village. We also have a helicopter available. A lot of us rely on transportation in and out of the Canyon by helicopter. If a traveler arrives with a lot of luggage, what would be the most affordable option for transportation? Oftentimes, they would rather hire a packhorse than carry their equipment in. A lot of them prefer to do that because they take the luggage directly to the campsite. If you take the helicopter, you still have to carry your gear another 2 miles from the village to the campsite. What is done with the animals during the offseason? Those are personal decisions that a horse owner would make, but oftentimes in the Havasupai culture, they would send them out to the free range for half a year and then bring them down to work during the summer. How is village life different during the offseason? Why not call it what it is? Please. It's well documented that these animals suffer horribly from physical abuse and malnutrition. Why on earth would a well respected magazine, owned by AAA, a well respected company, imply that it is acceptable to treat animals this way? Why encourage your readers/customers to turn a blind eye and contribute to the abuse. Sickening. Terrible. Just terrible. I agree with you. I"m canceling my subscription too and encouraging others to do so. I was there in May and the pack animal's ALL looked fine. When were YOU there to make this assumption? You were there in May? I guess you missed the 4 that were seized for abuse and the arrest that followed? Did you happen to see the horses without a pack. Did you see them being fed and watered? No assumptions on my part. I was there April 19th. Took my own photos of gaping wounds which I have been circulating. You say they looked fine. So you must have checked underneath all their packs to know for sure? Or did you just assume they were fine as you walked past them carrying enormous loads of gear, with their saddle sores hidden away beneath? Arizona Highways is not owned by AAA. It's "owned" by the state of Arizona and published by ADOT! Hello everyone, <a href="http://www.movescount.com/members/member2177091-makejanetjdavis">knowing it</a>'s my first pay a quick visit at this <br> <br> web page, and paragraph is really fruitful designed for me, keep up posting <br> <br> such articles or reviews. 9 horses went off the side of the switchback- all were tied together and all were carrying heavy packs. All were injured to varying degrees- No vet was called ( we offered to get one) No water was available( and never is at the top of the 10 mile hike) No food The accident occurred because the last horse in the line up of 9 was too young to be packing- he jumped the line and pulled the whole group down with him. Just one example of a very sad systemic problem with the treatment of these animals. I saw 3 horses injured that were packing. Then, the man was hitting one of them trying to get it to move faster. It was awful. I asked him to stop and he told me to mind my own business. I hated my trip there because so many horses were skinny and had open wounds. I won't go back. I wonder why you chose to write about this important thing in such a superficial way? Perhaps the reason you don't recall any horses needing to be euthanized recently is because when a horse is injured on the trail, it is not euthanized. It is left where it fell to die a horrible, agonizing death. There are videos from multiple sources and photographs from the same documenting that this is the way the packers deal with injured or no longer useful animals. They dispose of them like trash and go pick up another. Additionally, I would question, how are the horses euthanized? Using drugs that only a veterinarian has access to? You just said you don't have any veterinarians in the village. Or perhaps you dispatch them humanely with a single gunshot wound? Oh, wait, there aren't any guns in the village either (or, rather there aren't supposed to be). This entire article is a blatant attempt at a fluff piece to repair some of the reputation damage the Havasupai have suffered in the last couple months regarding their treatment of the pack horses. Although I am far from familiar with the inner workings of the tribe, I have the upmost respect for Ms Tilousi and the things she has accomplished for her people. Now it would be nice to see her direct some of that energy towards encouraging her people to take better care of their horses, and the council to pass laws making these offences punishable. For your information, there are already laws put in place by council that do make it punishable by law to prosecute individuals here is Supai. If you only stopped to ask the correct questions you would know this. What are we to change when there are already things in place to keep animals safe? It has started all because the B.I.A. stated they did not have the resources to handle cases involving horses. If they arrest an individual, where do they put the confiscated animals? Now since they have neglected their duties to the Havasupai community, the Havasupai receives all of the backlash from people like you. We did not choose to live like this. Your ancestors forced us into this tiny canyon, and we have done what we can to maintain our way of life. If it was up to us, we would have kept all of the land we once traversed, allowing our horses to feed from the earth naturally. We do not CHOOSE to live on limited land to have our animals starve when there is no money, a concept created by Your ancestors. The correct questions have been asked repeatedly, and gone ignored by the council. Financial aid and other resources have been offered to the tribe time and time again and been rebuffed. Animals in Supai are not kept safe. Please be honest. There is absolutely NO excuse for not providing these horses with shelter and water or for beating them and kicking their eyes out. This is perhaps one of the most blatantly deceitful articles I've ever read. I'm appalled at Arizona Highways. You have, with one misguided article, become part of the problem and not the solution for the TORTURED pack animals of Havasupsi. I challenge you to give the same space to one of the MULTIPLE not for profit animal assistance organisations crying foul. Contact Susan Ash, STOP ANIMAL VIOLENCE - SAVE Foundation, and learn about the factual physical evidence otherwise. Contact the US DISTRICT ATTORNEY who has successfully persecuted the first animal cruelty charge in our nation's history against a first world people. Again, your credibility holds no weight without the TRUE story being told. After my own recent visit to Havasupai, I find some of the comments here by Ms. Tilousi to be misleading, or outright false. We witnessed multiple horses with open wounds, sores, exposed bones. We documented this. Where was the "assessment" for vet care for these animals? Was the animal control person doing his or her job? We noticed no water and food in many horses pens...animal control finds that to be adequate care for these animals? It has been further documented by other tourists that many of these pack horses on the trail collapse from malnutrition and exhaustion, then cruelly left behind to slowly die in agony, rather than be euthanized, as is claimed by Ms. Tilousi. The abuse that is happening here is chronic and spans decades. It is a shame that more people from the tribe are unwilling to not only address it with honesty, but also to show a willingness to examine ways in which these animals can be treated with better care and the dignity they so deserve. Arizona Highways- we are canceling our subscription to your magazine. Shame on you for not doing a thorough job on such an important subject. The animal abuse had been well documented there. Every corporate leader in Arizona that has done nothing to stop this is as guilty as the abusers themselves. This isn't journalism. It's a poorly written damage control piece. I'm disgusted. The horse abuse and neglect is disgusting at havasu falls. I was horrified! I would never go there again, I have been truly scarred by seeing those poor horses/ mules and dogs. It's appalling and should not be allowed. Someone needs to do something! Dear Isabel - I know you're just doing your job, and I have not seen this abuse firsthand. But clearly it's happening. Did someone force you to submit this misleading article? You are a part of the problem. Hope you can find some way to redeem yourself. This article is so misleading. AZ Magazine has turned into another fluff magazine just to show pretty pictures to lure the uneducated into believing that all is well. I think the writer was trying to shed light on the fact that there are alternative methods of transportation aside from the mules. I for one am happy to know that ATVs could be an option. No one should use the mules. Ms. Menzel, I am struggling to understand the point of your article. If it was intended to accurately describe the life of a pack horse at Havasu Falls, you missed the mark by miles. 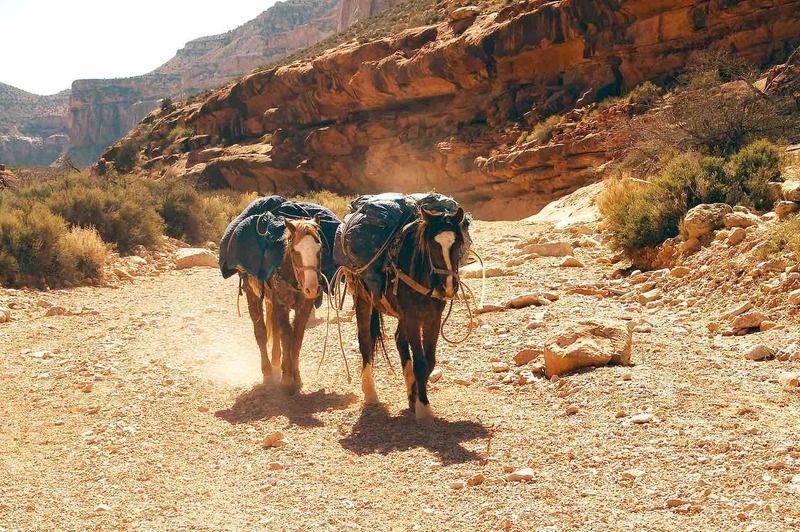 Even tribe member Carletta Tilousi seems sorely out of touch with the brutal reality that many pack horses and mules endure on a daily basis in the canyon. Her comment about how injured pack animals are dealt with is not only inaccurate, it's based on an ASSUMPTION, and one that too many tourists have provided evidence of to the contrary. Rather than being "assessed" and "euthanized," as Tilousi suggested, tourists have witnessed animals with broken backs, broken legs, and bleeding wounds be not only left to die an agonizing death on the trail, but be pushed off switchbacks and abandoned to be eaten alive by wild dogs. Yes, there are pictures, videos and testimony to back this up - I have seen it. And not only have the owners denied any kind of care to their animals, they have actualy threatened tourists who tried to help them. Perhaps you should have asked Carletta Tilousi what her reponse is to the growing media reports and public outrage over this long-standing abuse that far too many people have allowed to go on for decades. If you'd like accurate information on this situation, please visit http://www.havasupaihorses.org. Arizona is better than this, and Arizona Highways should be better than this. There are documented reports of abuse, saddles and packs that do not fit, visible sores on the backs of the horses and burros, and wanton starvation of the pack animals. Horses that have been rescued from there are visibly underweight to the point of animal cruelty. Tourists return from Supai saying they will never return, horrified at what they witnessed. This has been going on for decades. There are reports of a burro being left to die, torn apart by dogs. I'm appalled that Arizona Highways did not do an investigative article to document this abuse. Sadly this does appear to be a "damage control" piece. Even a cursory google search on the subject and review of recent television stories on the Havasupai Horses would show that the information on this article is suspect in its accuracy. This may have been unintentional. I would encourage the author to visit Supai, see the horses for themselves and evaluate if a follow up article is warranted. Although I do think Ms. Menzel should have addressed the issue of animal neglect better, I think she was trying to hint that there are other options (better options) than piling your baggage onto the horses. This comment is to the 2 previous folks who suggest that the point of this piece is to let visitors know there are alternatives to the horses (and mules, and donkeys - all equids). Yes, there is - the helicopter. That's it. The majority of the trail is not passable to ATVs, and there is not a public transportation service being offered utilizing ATVs. Additionally, it is worth noting that the helicopter pad is in the village, which is still 2 miles from the campground. Perhaps there are motor vehicles ferrying items from the village to the campgrounds but again, this is not a widely publicized option. Regardless, this article is garbage and irresponsible journalism. If the intent was for the author to let people know there are alternatives to horseback transportation, then come right out and say it. Why are we hinting? Did you REALLY print/post this? Are you not aware of the recent allegations of abuse of the pack animals? I'm disgusted. Save the Salt River horses, but screw the pack animals? I am truly disgusted by this "article". You had a chance to do something to end the horrible suffering of these animals. You could have made tourists aware of the cruelty their dollars go to support. Shame on you for failing to report the truth. Your magazine has lost all credibility. Shame on you Az Highways for painting a rosy picture of these often abused, starved and neglected animals. Don't forget the one who are beaten, tied on short ropes in hot sun and fall off cliffs tied together. The ancestors of this tribe would be ASHAMED of them for treating these fellow beings so badly! I commend those who captured the photographic evidence of the cruelty. Even if visitors don't hire the perpetrators, it cannot be denied that virtually everything being consumed down in that canyon was brought in on the bleeding backs of these starved animals. I was outraged by the defense comment in which the writer played the Indian card--the past. But do the math on the tourism money flowing in. Take a daily permit fee and multiply it by the sheer number of daily visitors, now upwards of 500. That will buy a lot of feed and hay, and the services of a farrier and veterinary care. Speaking of which, has anyone considered the fact that the roaming stray dogs, subject to periodic spaying and neutering campaigns, are likely not routinely vaccinated against rabies? For decades, since the NatGeo article, I have dreamed of visiting the turquoise falls in the canyon. But the tribe enjoys enrichment from the tourism, and the cruelty against those beasts of burden who provide their livelihood is inexcusable. There are good youtube videos and documentaries of the falls. Discovering the blatant animal cruelty going on is a good reason not to contribute to it. Only when the bad press reaches the masses and affects that tribe economically, impacting their cash flow, will they finally take action and stop trying to justify their cruelty on cultural grounds. What a ridiculous argument. As I was reading other travel and guide blogs on the canyon, I discovered another dirty, downplayed secret: the most common cause of injury and death is not rattlesnake bite nor scorpion stings: it is crashes of sightseeing flights, both fixed wing and helicopters. Yet another reason for crossing this trip off the bucket list and leaving the filming to the professional videographers. The bottom line is, everything from the soap, shampoo and bedspreads in the lodge to the food cooked and served out of that cafe was carried in on the bony, bleeding backs of those starved and neglected pack animals. Until and unless there are positive reports they have cleaned up their act, and the saddles fit and there are weight limits, and veterinarians certify good health and humane treatment, don't go. These people have no conscience. The only thing they will understand is a boycott.